Use bar sealers to seal polyethylene, tubing and polypropylene. Choose from a wide range of sizes 100,200,300,400mm even up to 800mm. Ensure you purchase the right size for your application. Opting for a larger size might be beneficial for future jobs. Certain models come with an inbuilt cutter blade to achieve nice clean edges. Spare parts are available. If you require new elements or Teflon strips or even new components please contact us for pricing and information. Machine repairs are available upon request and with heavy usage these bar sealers need to be constantly cleaned and serviced. 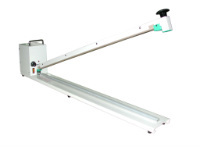 A wide range of bar sealers are available, for additional models please contact us for more information.